The Hermitage: The house in Murrells Inlet where Alice Flagg died. Photo by Sid Rhyne. 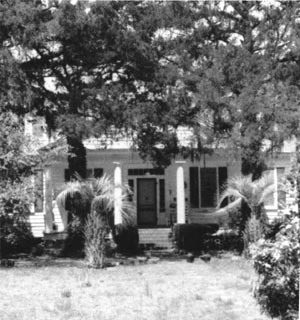 Dr. Allard Flagg moved into his new home, The Hermitage, on Murrells Inlet, in 1849 and invited his widowed mother and his sister Alice to live with him. With delicate features, luminous brown eyes, and thick auburn hair that hung to her waist, Alice was a girl of unusual beauty. Alice had not shown any interest in a beau, but her older brother Allard was beginning to cast interested glances toward Penelope Bentley Ward, and her other brother, Dr. Arthur Flagg, was openly courting Penelope's sister, Georgianna Ward. The Wards of Brookgreen Plantation were the most noted of the planter families in the Low Country during the late 1840s. The amount of rice and oats cultivated by the Wards on their various plantations amounted to millions of pounds, and the vegetables grown in the gardens were harvested in enormous amounts. Each year several thousand bushels of corn, peas, beans, and sweet potatoes were brought from the large gardens. The Wards also had a salt-making system on the nearby seashore, which was capable of producing from thirty to forty bushels of salt per day. The rector of All Saints Episcopal Church at Pawleys Island considered the Wards among his most devoted and loyal parishioners, and all other planter families in the parish looked up to the Wards as far as achievement and prestige were concerned. So when word spread that Dr. Allard Flagg was interested in Penelope and Dr. Arthur Flagg was interested in Georgianna his best friend, no one thought a thing of it. It was a natural course of events. Alice Flagg was pleased that her brothers had chosen cultured young women of good taste as their friends, and she delighted in the merrymaking that prevailed when the Ward girls came to The Hermitage. But for Alice, prestige, achievement, culture, and good taste weren't the only qualities to look for when considering someone to marry. And for this, she had someone in mind. One day a handsome young man came to call on Miss Alice. She had met him when she was shopping one day. Tall Dr. Allard met the man in the flower garden under a huge spreading oak tree and at once came to the conclusion from his speech, manners, profession, and background that the man was not suitable to be a friend of his sister. The caller was sent away without even a word with Miss Alice. But Alice was not to be cowed, and she secretly kept in touch with her friend. After several weeks had passed, she boldly invited him to visit her again at The Hermitage. He agreed to come and told Alice that he would take her for a ride in his buggy, pulled by a team of fine bay horses. He arrived early in the afternoon and was ushered by a servant into the imposing drawing room of The Hermitage. In a few minutes, Alice descended the staircase in the hallway and hurried into the drawing room. She did not disguise her happiness over seeing her friend. They left the drawing room and went to the wide porch and down the steps, where Alice's beau helped her into his carriage. Just as the suitor was ready to step up into the other side, Dr. Allard appeared on the porch. ''Wait!'' he cried out. He ran down the steps, pushed the young man aside, and got into the buggy beside his sister, taking the reins. ''I have sent someone to bring my horse,'' Dr. Allard said. ''You'll ride the horse. I'll ride in the carriage with Alice. You may ride beside us and talk to Alice.'' The young man reluctantly agreed to the arrangement, but there was very little conversation between him and Alice that afternoon as they rode along, he on the horse, she in the carriage with her brother. Dr. Allard, Dr. Arthur, and their mother had a family meeting, and it was decided that Alice would not be permitted to see her friend again. In the meantime her friend had secretly met her and slipped a ring on her finger and told her to consider it an engagement ring. She was ecstatic. They were very much in love. When Dr. Allard saw the ring, he demanded that Alice remove it and give it to him so he could return it to the young man. She removed the ring, promising that she would return it, but she slipped it on a ribbon and tied the ribbon around her neck, concealing the ring beneath the collar of her dress. In another family meeting, it was decided that Alice would be sent to Charleston to attend school so that she would forget about her beau. This was against her wishes, and she went reluctantly, but there was nothing she could do about it. Alice cried for hours before she unpacked her trunk. She disliked everything she'd ever heard of Charleston: the mansions set far back from the bay, the almost-noble aristocracy, the societies that afforded merriment for the upper class, and most of all, the school where she was now stuck! Tears ran down her cheeks and fell on her dress, the one she treasured above all others, the soft white one with the wide ruffle that served as a collar as well as sleeves, for it draped over her shoulders and arms to her elbows. When she had finished unpacking, she pushed her trunk under the bed. It was only then that she looked around the room that she was to occupy. The bed looked comfortable, but the curtains were of a coarse gauze, and the entire room lacked color. It lacked Warmth. Everything was so different in Charleston, and she missed her young man so much. Several weeks passed before Alice began to get accustomed to the city. The pace wasn't quite so leisurely as at Murrells Inlet, and the sounds were startling. There was much screaming and talking when the fishing fleets came in at sunset, some of the fishermen taking care of the sails and cleaning the boats while others prepared the fish for market. Other sounds that surprised Alice were the street cries. Shrimp men chanted ''shrimpy-raw-raw-,'' while vegetable women carried their products in huge baskets balanced on their heads as they called out, ''vejjy-tuble, vejjy-tuble!'' Then, there was the rattle of empty milk tins being taken from doorways and full ones left in their places, the ice wagon and the clop,clop of the robust horses that pulled it, and the fire engine's clanging bell as it rushed to a fire. She could hear the chimney sweeps on the roofs and the lamplighters in the evening. Though Alice did her best to adjust to Charleston and apply herself at school, she did not forget her turpentine dealer back home for one minute. Although he was considered to be ''beneath the notice of a Flagg,'' she loved him with all her heart. Many times a day she pressed a hand to her chest to make sure her ring was still hanging on the ribbon around her neck. Late on night, after attending a ball at the St. Cecilia Society, Alice became ill. The physician concluded that she was afflicted with malarial fever. Her family must be notified immediately, he told the school authorities. When word of Alice's illness reached Dr. Allard Flagg, he left The Hermitage at once for Charleston in his carriage. By the time he reached Alice's bedside, she was delirious. Dr. Allard gave her some medication and ordered that her trunk be packed. He was taking her home to The Hermitage. The journey to Murrells Inlet was not an easy one. It was raining, and the sky was dark with heavy clouds. There were seven rivers to be crossed by ferry and the roadways were sandy and the edges ill-defined, causing the carriage to slip into a ditch at times. Finally, Dr. Allard arrived between the avenue of oaks leading to The Hermitage. When the frail girl was lifted from the carriage, her brother saw that she was much, much worse. Alice Flagg drifted into and out of consciousness all night long. Sometime during that first night she was back in her home in Murrells Inlet, she reached for the ring on the ribbon. It was not there! She begged, weakly, ''I want my ring. Give me my ring.'' But her ring was not returned to her. By morning she was dead. 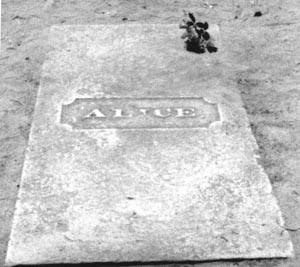 The body of Alice Flagg was dressed in her favorite white dress, and she was buried in the Flagg family plot at All Saints Cemetery near Pawleys Island. A plain marble slab was placed over her grave. Only one word is on the slab - ALICE. Many times since the death of Alice Flagg there have been accounts of her being seen at The Hermitage. She comes in the front door and moves silently up the staircase to the bedroom that belonged to her. Sometimes she comes early in the evening, and at other times she makes her visits late a night. Also, it is said, she has been seen in the ancient graveyard at All Saints Church. But wherever she is seen, she always seems to be searching for something, while holding her hand over her chest.